Much is being said today about the so-called wealth gap that purportedly exists among black households and white households in America. 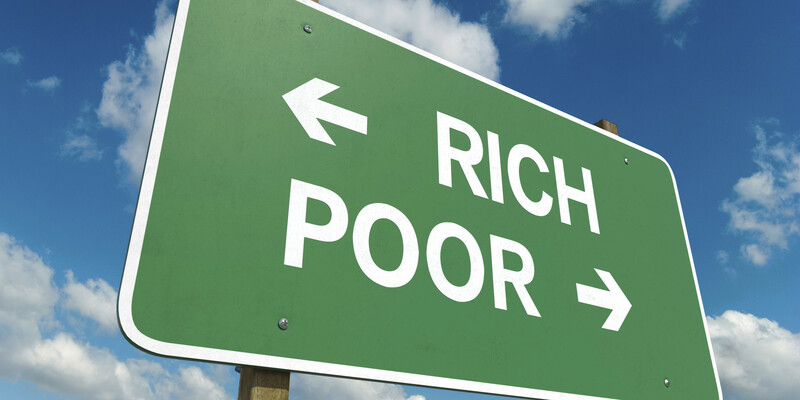 I say purportedly not to deny that such a divide exists – it does – but to highlight that the very term wealth gap is inherently misleading, as it assumes that such imparity is innately unfair – if not immoral – and, as such, should be redressed under the nirvanic pursuit of “income equality”. the ratio of the share of national income going to the richest 20 percent of households in a country to the share of the poorest 20 percent. When speaking of the wealth gap strictly in terms of numbers the data are indisputable. From 2010 to 2013, the median wealth of non-Hispanic white households increased from $138,600 to $141,900, or by 2.4%. Meanwhile, the median wealth of non-Hispanic black households fell 33.7%, from $16,600 in 2010 to $11,000 in 2013. On the surface, these numbers appear to paint a rather disadvantageous and inequitable picture in and of themselves. Nevertheless, in today’s politically-correct, hyper-sensitive society, context is more important now than ever. This is especially true considering that the default milieu in which matters of wealth acquisition and distribution are debated – in terms of race as opposed to socio-economic class – is that any “gaps” that do exist are solely the result of institutional and structural injustices committed by white people against black people. Notwithstanding the above-referenced data from Pew, the truth is the black-white wealth gap should not be viewed strictly in terms of dollars and cents. True, there are any number of quantifiable reasons for why such disparities exist, but that they exist does not suffice as a sufficient argument that they should not exist. In other words, that there is disparity does not necessarily mean there is inequality. There is a fundamental problem with using “inequality” to describe the income disparity between black and white households. The word inequality intrinsically conveys that the wealth “gap” is a problem to be remedied simply because there is a gap, and that the acquisition of wealth is the only solution to mitigate that disparity under the subjective premise that income inequality is patently “unfair”. But to assert that income inequality is somehow unfair is to place oneself in the throes of a philosophical dilemma. For to argue that anything is “unfair” is, by definition, to introduce into the conversation the question of morality. Consequently, one is forced to consider by what or whose standard of morality should income inequality be deemed unfair. Hence, what began as a circular discourse rooted in subjectivity and ambiguity has morphed into a theological exercise on the level of untying the Gordian Knot. A highly popular television sitcom The Jeffersons ran on the CBS network for 11 seasons (from 1975 to 1985). The Jeffersons followed the lives of George and Louise Jefferson, an African-American couple who relocated from the poverty of Queens, NY to Manhattan, as a result of the success of George’s dry-cleaning business chain. The theme song from The Jeffersons was titled Movin’ On Up, the lyrics of which celebrate the fact that the rambunctious George, and his beloved wife Louise, had finally achieved their dream. In other words, they had conquered the wealth gap. There ain’t nothin’ wrong with that. Please understand that I do not believe there is anything inherently wrong with an individual endeavoring to achieve the “American Dream” and acquiring their own “piece of the pie”. But when those pursuits are engaged in solely under the pretense of “income inequality”, a philosophy predicated on pitting the haves of the world against the have-nots, then perhaps the time has come for a re-evaluation of motives (James 4:1-3). A major fallacy of the black-white wealth gap is it assumes a cause (e.g. systemic racism) without regard to other factors that might contribute to it. 42 percent of African Americans report using their credit cards for basic living expenses like rent, mortgage payments, groceries, utilities, or insurance because they do not have enough money in their checking or savings accounts. African Americans carry an average credit card balance of $5,784. Just 66% of African American households report having a credit score of 620 or above, compared to 85 percent of white households. 50 percent of indebted African American households who incurred expenses related to sending a child to college report that it contributed to their current credit card debt. 71 percent of African American middle-income households had been called by bill collectors as a result of their debt, compared to 50 percent of white middle-income households. What no one is talking about concerning the black-white wealth divide is the role human behavior plays in helping facilitate that gap. It is a universal truth that when, in our self-centered efforts to “move on up” in life, we choose to violate the principles of God’s Word, we should expect certain outcomes as a result. Debt: Psalm 37:21; Ecclesiastes 5:5; Proverbs 22:7; 21:17; Luke 14:28; Romans 13:7-8. Co-signing: Proverbs 6:1-5; 11:15; 17:18; 22:26-27; Ecclesiastes 5:5. Material possessions: Proverbs 15:27; 21:20; 23:17; Matthew 6:19-34; Luke 16:11; James 4:1-3. Money/Wealth: Deuteronomy 8:18; Proverbs 13:22; 23:4-5; Ecclesiastes 5:10; Matthew 6:21; Luke 16:13; 1 Timothy 6:10. Contentment: Proverbs 5:15; 16:8; 23:22-23; 30:8-9; Matthew 6:33; Galatians 5:26; Philippians 4:11; 1 Timothy 6:6-8; Hebrews 13:5. This is not to suggest or infer that the black-white wealth gap is attributable solely to a collective disregard for biblical principles on the part of black Americans. I am not naive to the reality that not all black Americans – nor Americans in general – are believers in Jesus Christ and submit their lives to the spiritual disciplines set forth in His Word. To be sure, not even we who are believers in consistently abide by His precepts (Luke 6:46). Nevertheless, the reality is personal responsibility is a major factor in the black-white wealth gap being what it is. It would be disingenuous, to say the least, to suggest that socio-economic factors alone (e.g. unemployment, racism) are at fault in creating this imbalance. It may not be politically correct to say this, but the truth is not everyone is destined to achieve the American Dream. The sovereignty of God is such that, ultimately, it is He who determines to what degree we experience success in this world, whether material or otherwise (Joshua 1:8; Psalm 20:4; 118:23-25; Deuteronomy 8:18; Romans 9:14-16). With this (God’s sovereignty) in mind, as followers of Christ, contentment should be our goal not closing the wealth gap (1 Timothy 6:6-8). This is not to suggest that one should not aspire to improve their socio-economic station, but that they should do so with the larger picture in mind – eternity. For, indeed, what does it profit a person to gain the whole world, and forfeit their soul (Mark 8:36)?